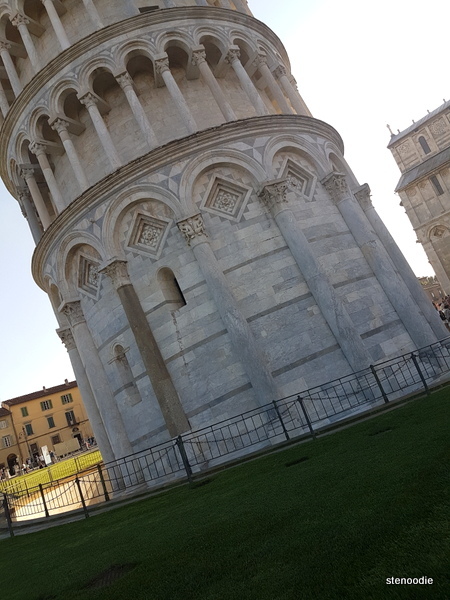 Finally seeing the Leaning Tower of Pisa in person! Today, we vacated and checked out of the Vaticumum 67 bed and breakfast. 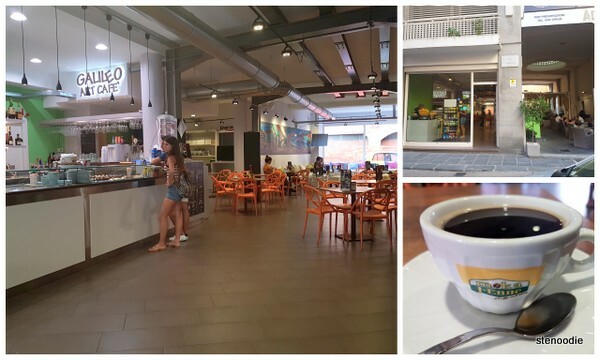 We went to the La Pasticceria Siciliana bakery for the last time to redeem our final breakfast. This time, I got a caffe latte (fourth one in a row) and a fresh cannoli!! 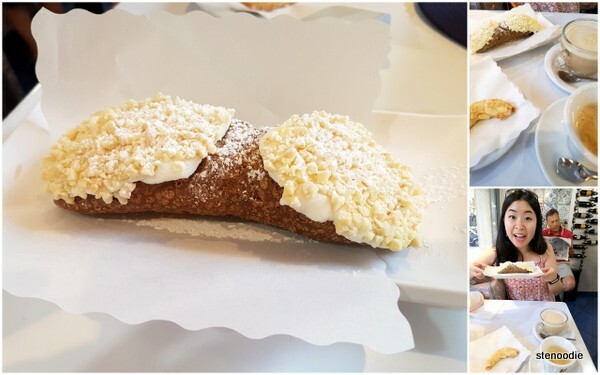 It was my first cannoli in Italy and I was inspired to get this Italian pastry for breakfast after I saw a man order it for breakfast yesterday. I especially wanted to try it because the shell was freshly filled with pastry cream on the spot upon ordering. I was so excited to try it! The fresh cannoli lived up to its hype!! I chose an almond one and there were little bits and pieces of ground almond on the cannoli cream. The cream was sooo soft and creamy while cool and cold. This coldness made the usually heavy treat taste so refreshing and light! I also really liked the shell of the cannoli as it was crispy but not hard or chewy. It was a perfect cannoli. The pastry that Ken got (both of ours had to be supplemented with a €1 for the difference in cost from the free voucher) was an almond treat as well but much smaller in size. It was chewy and tasted good but a bit too sweet for my taste. 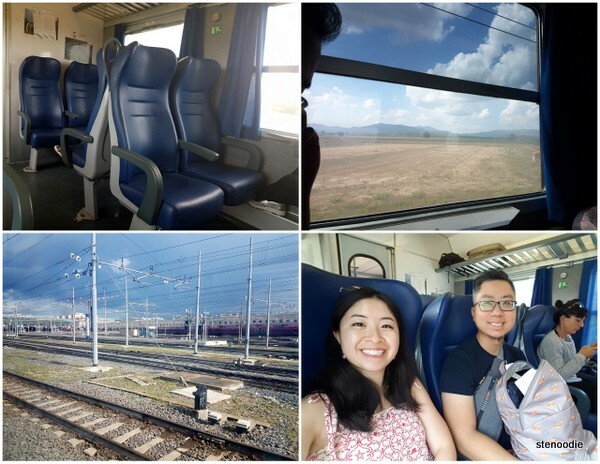 We picked up some fruit and water for our four-hour train ride to Pisa. 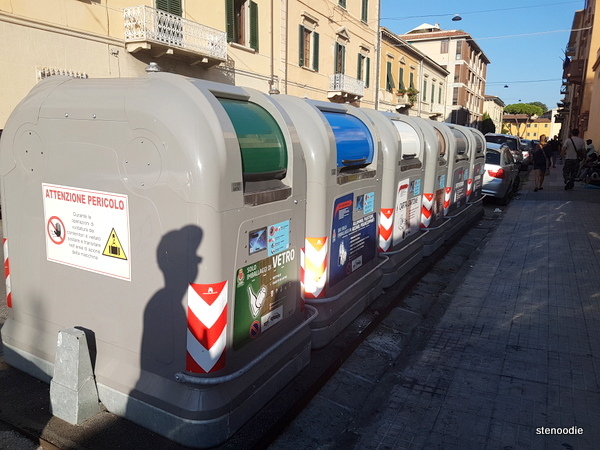 We bought €1.50 tickets from the Cipro subway to Tremini station. 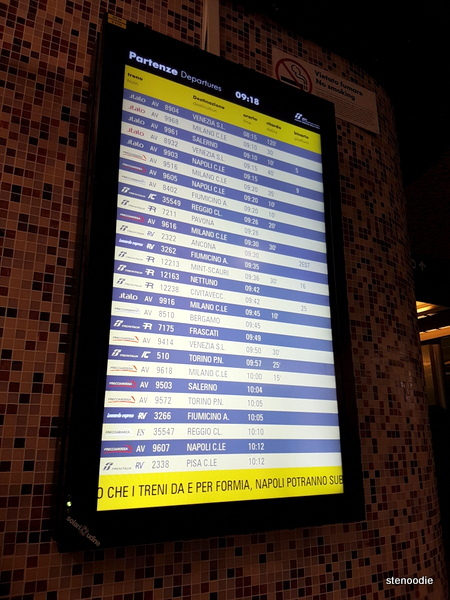 From Tremini station, we followed the signs to board the train. We were there very early and thus waited for 45 minutes for the platform number for our train to show up on the screen. Our train was scheduled for a 10:12 a.m. departure. Upon seeing the platform number show up, we walked to platform 25. 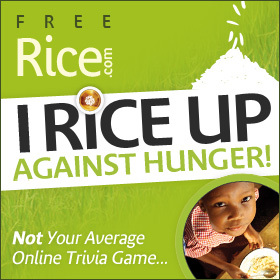 I found that the staff there weren’t very helpful to guide us or to answer our questions. We didn’t have assigned seating and wanted to inquire about it. The male staff barely acknowledged us, so we simply guessed that there wasn’t any assigned seating and boarded the train before it was too late. Once we did get on the train, we saw there were no numbers on the seats and thus no assigned seating was a confirmed thing for us. The four-hour train ride actually passed by quickly. I slept for half of it. The seats were quite comfortable and wide. We had air conditioning in our train cabin (apparently not every cabin had air conditioning, so we were lucky that the one we chose to sat in had it). There were washrooms available too (clean ones). There was no food trolley service available and you had to pay attention to your stop to get off as there were quite a lot of them and the announcements were softly heard on the speakers. 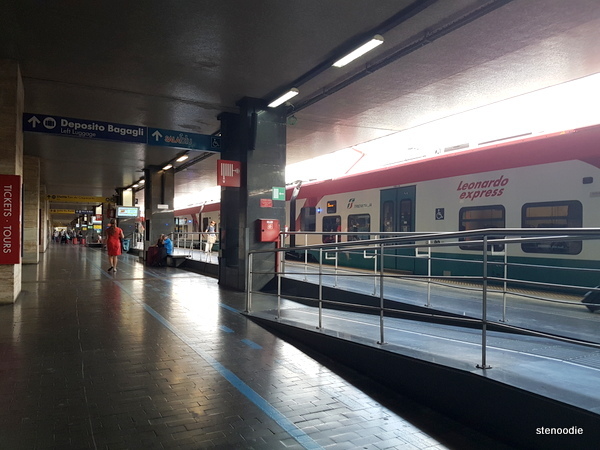 We arrived at the Pisa Centrale station at 2:15 p.m. on schedule. 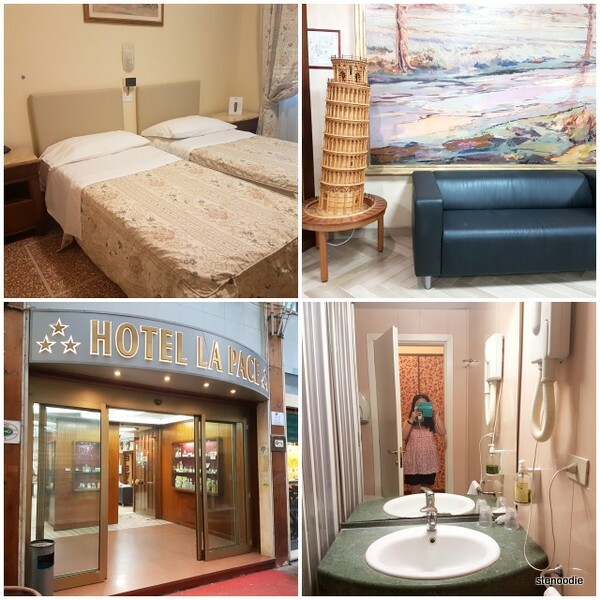 Our hotel for our one-night day in Pisa was just two minutes walking from the station. It was super convenient! Upon checking into Hotel La Pace seamlessly, we were in search of lunch. 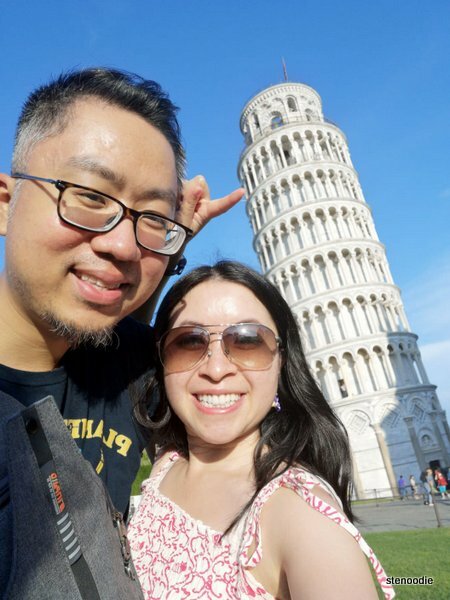 Unfortunately while there were a lot of good restaurants which were in the area, they were closed at 3 p.m. Google Maps then showed me a good restaurant 10 minutes away from us and also on the way to the Leaning Tower (which was where we were going to after lunch). Unfortunately, when we got there, the recommended restaurant was closed! 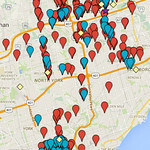 They must have not updated their business hours to reflect the change on Google Maps. 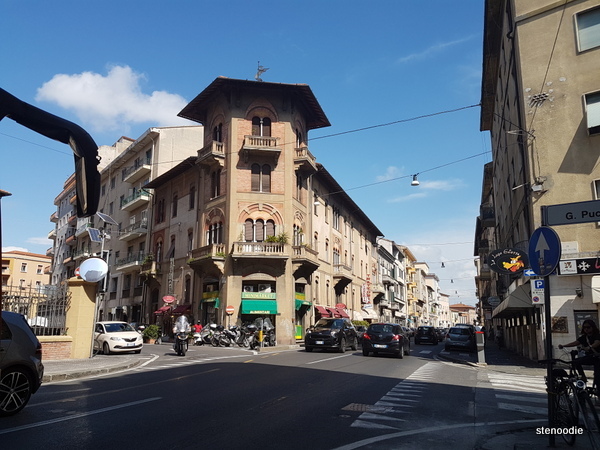 Anyway, we looked two doors down and found Numeroundici, a cafeteria-type restaurant, and walked in to eat since we didn’t want to pursue any others at that point. We were in for a pleasant surprise because this turned out to be one of the best meals so far on this trip. We ordered two mains and two sides and two drinks as well as bread. We finally were able to try Italian tripe too! 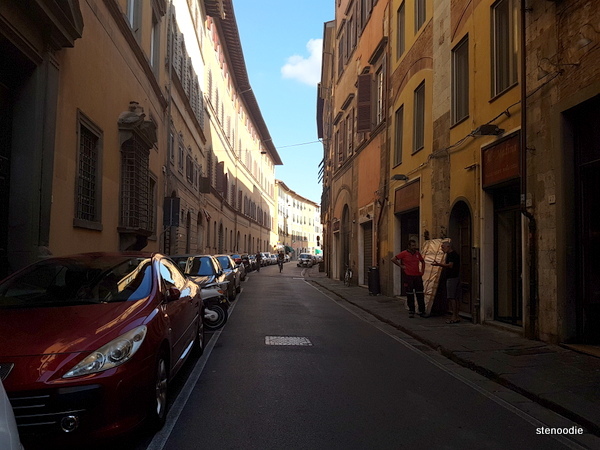 Read all about this amazing Tuscan lunch at Numeroundici here. 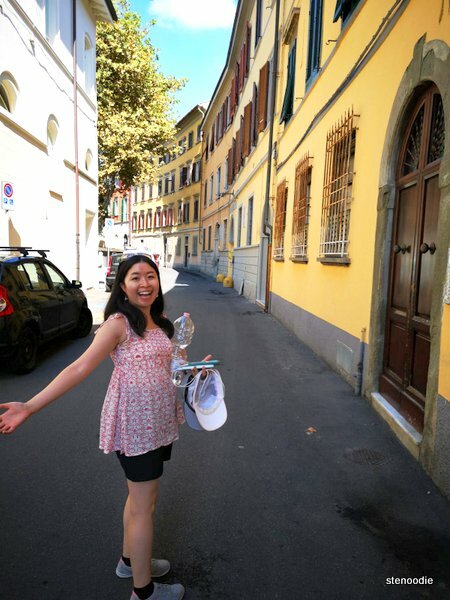 Next up, we had a quick stop to the closest pharmacy to get after-bite and insect repellent because the mosquitoes were painfully eating me alive. 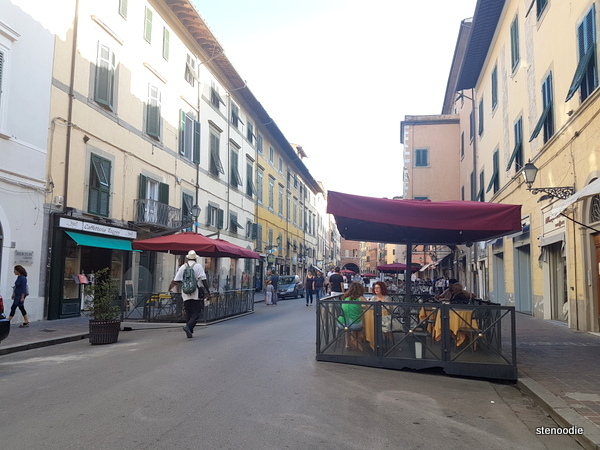 We also stopped into the Galileo Art Cafe (Via Garofani, 6, 56125 Pisa PI, Italy) for an Americano (and to use their speedy Wi-Fi). After sitting there for a spell, I couldn’t grasp the concept of how they had anything affiliated with the Galileo scientist. It was a very spacious and modern cafe though. 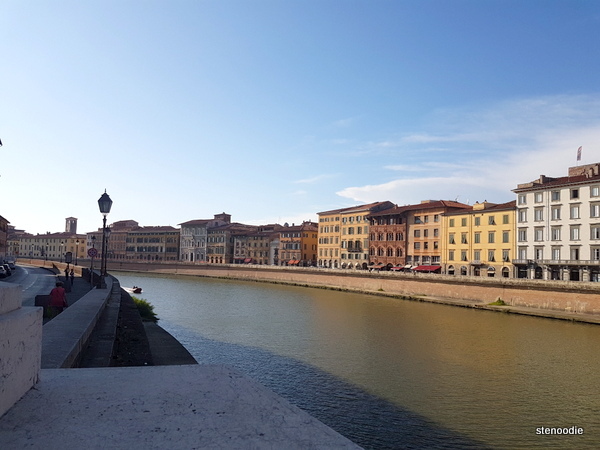 Anyway, we crossed the bridge across Arno River to casually browse for the Leaning Tower of Pisa (Piazza del Duomo, 56126 Pisa PI, Italy). 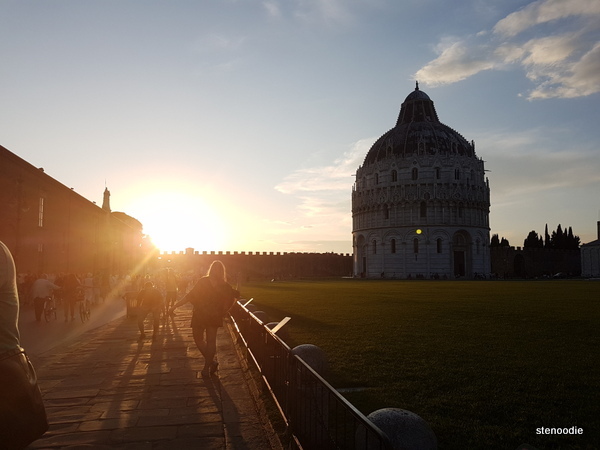 We didn’t need to follow any maps for this one since the area was small and we had all the time in the world to sightsee Pisa. 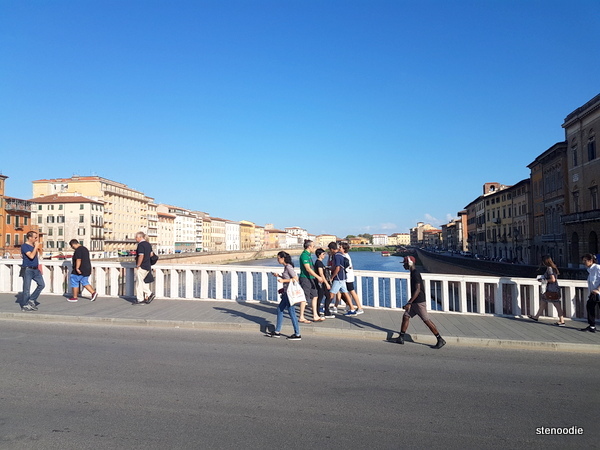 The Ponte di Mezzo bridge was gorgeous. 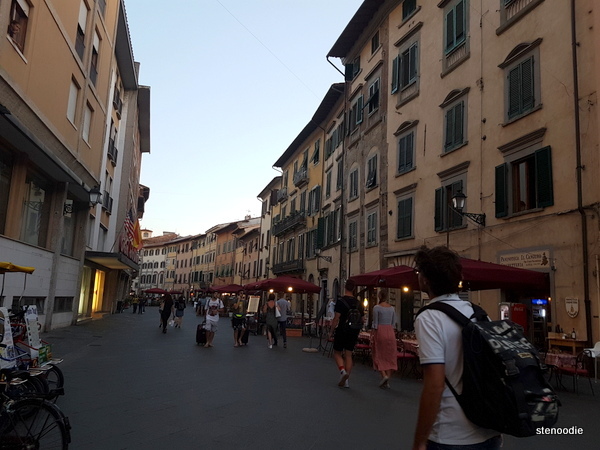 Once on the other side, we encountered many restaurants and shops. The restaurant patios were again of a different style here than Rome (and reminded me of the sidewalk patios in Montreal). 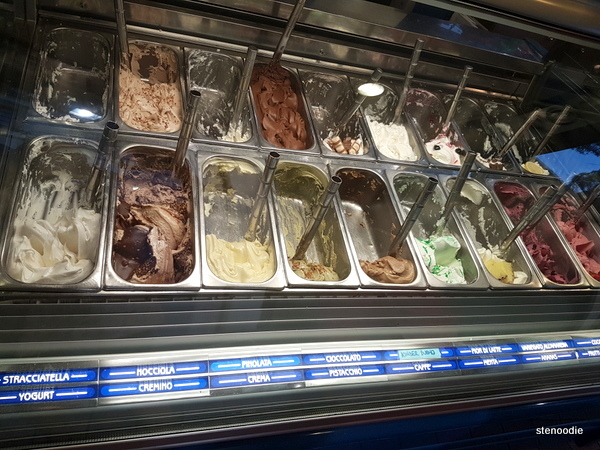 I stopped into a number of gelato shops to shop their flavours. 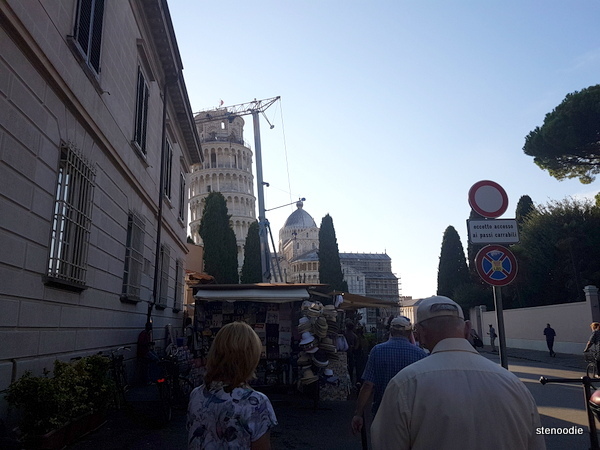 I noticed that flor di latte (sweetened cream, no flavourings, no egg yolks) was one I hadn’t noticed yet on our trip so far in Italy and made a mental note to try it before leaving Pisa. 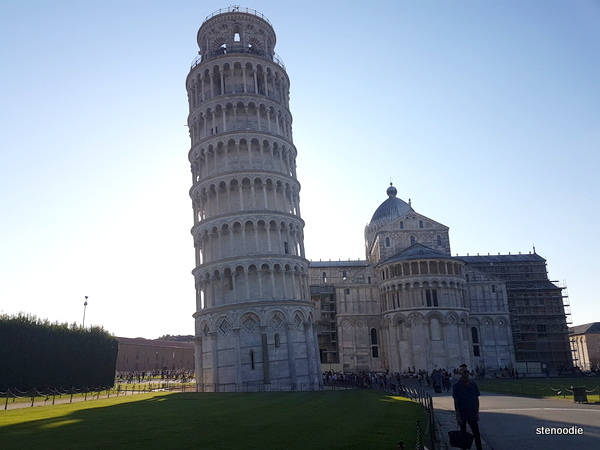 Soon, we did serendipitously encounter the famous slanted tower. Yay! It was a bit surreal at first to see it with my own eyes. My first reaction was that it really was slanted in an abnormal way. It was so beautiful and surreal to see it in person. The first look of the tower! 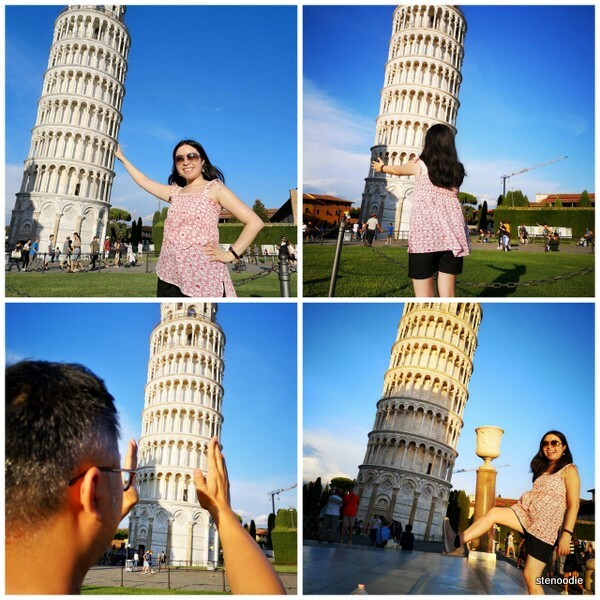 We did as the other tourists did and tried to “push” the tower or trick the camera into different angles to come out with a fun photo. There were so many possibilities and you can get a good photo no matter how far or close you stand. 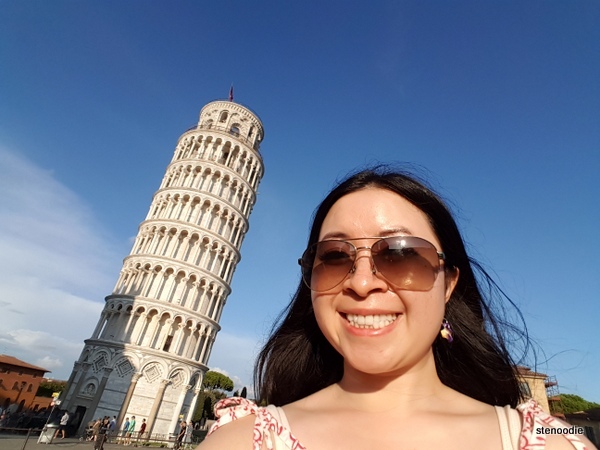 The photographer just has to know how to maneuver and adjust the angles to make the photograph look like you’re doing it perfectly. It’s not an easy skill but one that takes practice and is achievable. 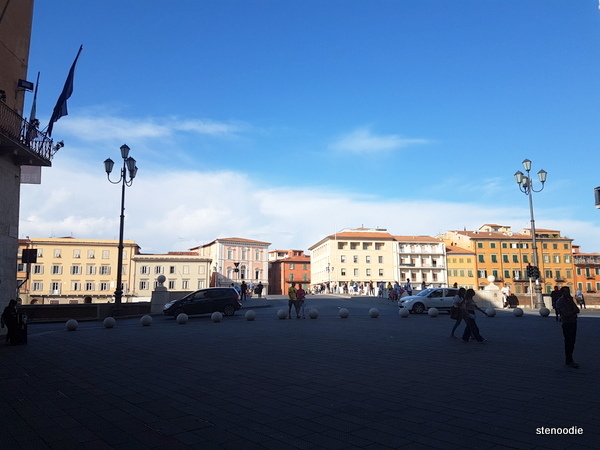 After this, we got my much-wanted flor di latte gelato from Gelateria Orso Bianco (Via Francesco Crispi, 51, 56125 Pisa PI, Italy), a random gelato shop. 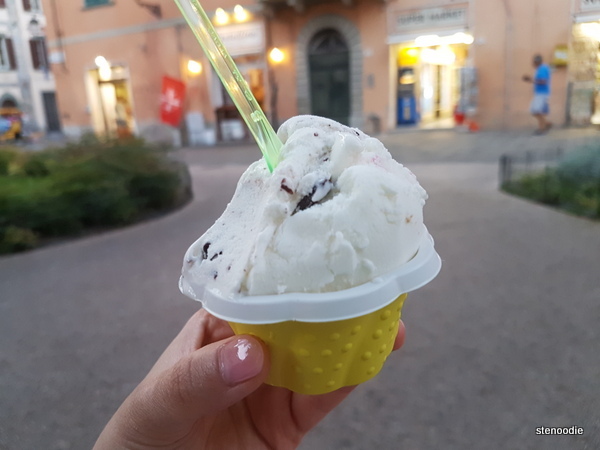 We got a small cup of flor di latte and stracciatella (vanilla and chocolate) gelato. The flor di latte was so creamy and milky. It was great. I shouldn’t have chosen the second flavour that had a vanilla base since it became tough to differentiate the flavours. After this, we were in search for dinner. It took a while since we were purposely avoiding “tourist trap” restaurants and wanted authentic local dining experiences. By chance, while trying to find a restaurant, we stumbled upon this famous mural. 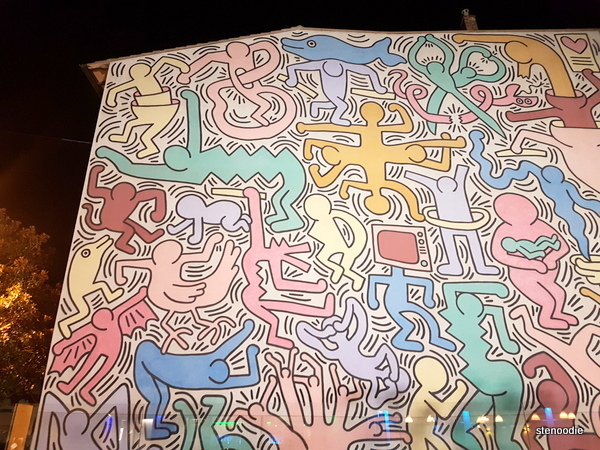 It’s called Tuttomondo (Allworld – The Pisa’s Mural ) by Keith Haring that is dedicated to universal peace. 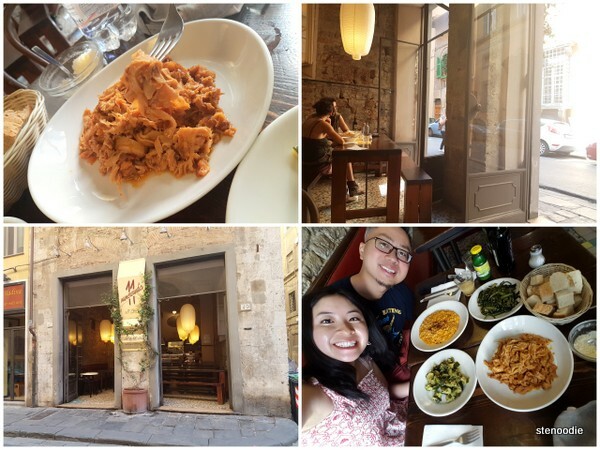 We finally ended up at Ristorante Lo Schiaccianoci, a mom and pop restaurant serving Tuscan cuisine and seafood. We were in for a treat. We didn’t have to wait for a table when walking in at 9:30 p.m. on a Friday evening. 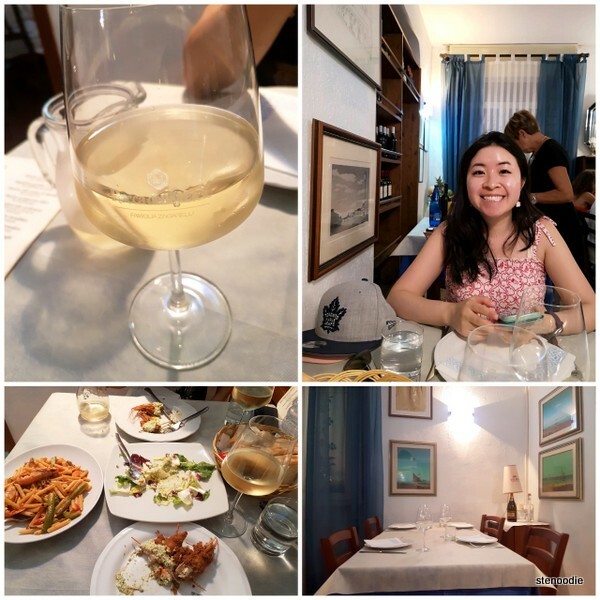 Read about our seafood dinner at Lo Schiaccianoci here. 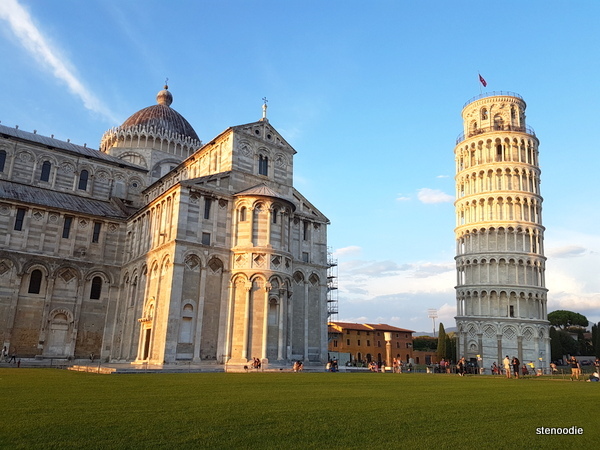 Tomorrow, we depart Pisa and head to Florence! 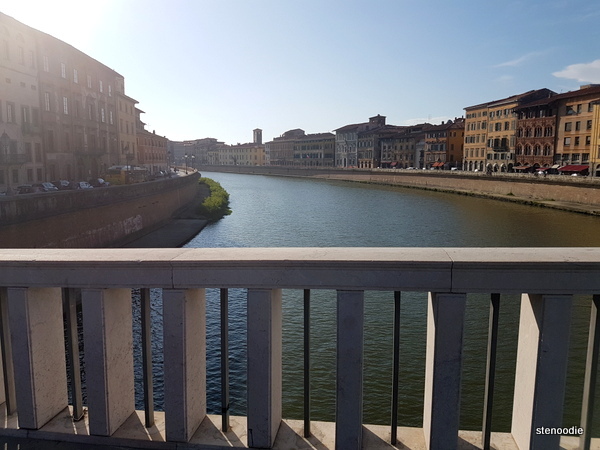 This entry was posted in Travel and tagged @GalileoArtCafe twitter, Arno River Pisa, Cannoli for breakfast at La Pasticceria Siciliana, Flor di latte and stracciatella (vanilla and chocolate) gelato, Flor di latte gelato, Galileo Art Cafe in Pisa, Gelateria Orso Bianco, Hotel La Pace in Pisa, Italian Tripe, Italy travel blogs, Leaning Tower of Pisa, Leaning Tower of Pisa first glimpse, Leaning Tower of Pisa selfie, Pisa Cathedral and the Leaning Tower, Pisa Italy things to see, Pisa travel blogs, places to go in Pisa Italy, Ponte di Mezzo, Ponte di Mezzo bridge, Ponte di Mezzo bridge at night, Ristorante Lo Schiaccianoci dinner in Pisa, the Leaning Tower of Pisa, Train from Rome to Pisa, Train ride from Rome to Pisa, Travel and food blogger, Tuscan lunch at Numeroundici, Tuscan Seafood dinner, Tuttomondo mural by Keith Haring, where to eat in Pisa Italy. Bookmark the permalink. Ahhh…that cannoli looks amazing! 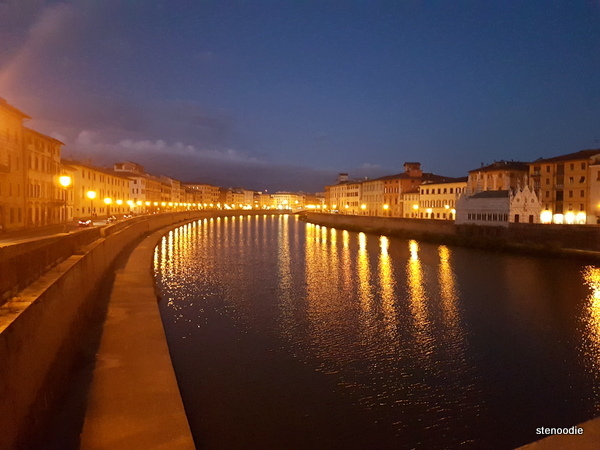 I love your shot from the Ponte di Mezzo…really beautiful at night. Thank you so much, Nick! 🙂 That cannoli was simply the best! I loved the tower pictures! So cute!